Lewis Morrison was one of the most prominent stage actors of his time. He was best known worldwide for his portrayal of “Mephistopheles” in Faust. He was also the first black Jewish officer to serve during the Civil War. Lewis Morrison was born in Kingston, Jamaica on September 4, 1845. He was named Morris W. Morris at birth, although some sources claim that Moritz W. Morris is the correct spelling. Very little is known about his family history. After the Civil War, he changed his name to Lewis Morrison for unknown reasons. His great great grandson, Phil Downey, later claimed that Morris changed his name to escape his African and Jewish heritage. Morris left Jamaica for the United States as a youth. At the outbreak of the Civil War, he enlisted in the 1st Louisiana Native Guard, the first official black military regiment in the Confederacy, with other free blacks. He soon rose to the rank of lieutenant, becoming the first black Jewish officer to serve in the Confederate Army. When the Louisiana State Legislature banned people of color from serving in the Confederate Army in February 1862, the regiment was disbanded. Morris and about 10% of the other former 1st Louisiana Native Guard joined the Union Army in September 1862 and were organized into a new unit that was assigned the same name. There Morris became the first black Jewish officer in the Union Army. Lewis Morrison made his stage debut in New Orleans in The Loan of a Lover. He gradually secured additional acting work, including a supporting role to Edwin Booth’s lead role as “Richelieu.” Morrison moved to San Francisco in 1874 to perform at the California Theater for the next three years. When he returned east, he gained recognition for his performance in The Legion of Honor at Park Theater, under Henry E. Abbey’s direction. By the 1880s, Morrison had joined performers at the Walnut Street Theater in Philadelphia where he played leading roles opposite famous stage actors of that time, including Adelaide Nelson, Lucille Western, and his first wife (1866-1886), Rose Wood, a prominent English-born stage actress. After Morrison rose to fame for his role in Victor Durand, he formed his own touring company and performed around the world with second wife (1892-1906), Florence Roberts, as his leading lady. Morrison became a worldwide icon for his portrayal of “Mephistopheles” in Faust, which opened in New York in 1889. While Morrison tried to introduce newer plays to the theater-going public, Faust was the most successful. 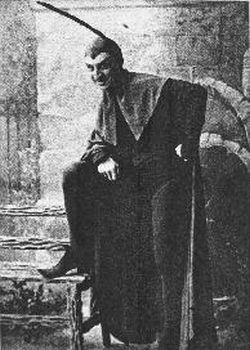 He played “Mephistopheles” for fifteen years without a break until his death of complications from stomach surgery in 1906. Morrison and Wood were grandparents to Constance and Joan Bennett, two successful Hollywood actors. Errol Hill, The Jamaican Stage, 1655-1900: Profile of a Colonial Theatre (Amherst: University of Massachusetts Press, 1992); Brian Kellow, The Bennetts: An Acting Family (Lexington: University Press of Kentucky, 2004); James G. Hollandsworth, The Louisiana Native Guards: the Black Military Experience during the Civil War (Baton Rouge, LA: Louisiana State University Press, 1995).